San Miguel de Arrechinaga, Markina-Xemein, Biscay, Northern Spain. Latitude 43.267458. Longitude 2.49396. The little Basque town of Markina-Xemein in the Pais Vasco, province of Bicay, north-eastern Spain is much like any other town in the Basque country, but here we have a very curious site. The little church and hermitage of San Miguel de Arrechinaga stands just across the bridge at the western-side of the town on the Xemein Etorbidea road. It is built around three huge megaliths or, a dolmen? The town is situated on the main B1 633 road running north-east to south-west. Bilbao is some 26 miles to the west, while the town of San Sebastian is about the same distance to the east. Although the huge stones within the sanctuary of San Miguel’s church have often been referred to as a prehitoric dolmen, it is almost certain they are not. In fact, they owe more to geographical history. The three odd-shaped, gnarled and distorted boulders are probably the eroded remains of a huge rock outcrop from the hill-side that was formed in the Tertiary period many hundreds of millions of years ago, perhaps 40 million years ago? At least that is the general consensus. So, in other words they are a natural feature, and nothing to do with prehistory. In the middle-ages, according to legend, a local hermit came to live here and built his cell beneath the huge stones. His name was perhaps St Pollonio. Later, a church was built around the three stones and the hermitage, a site that was by that time revered as a place sacred to St Michael the Archangel – patron saint of high places. 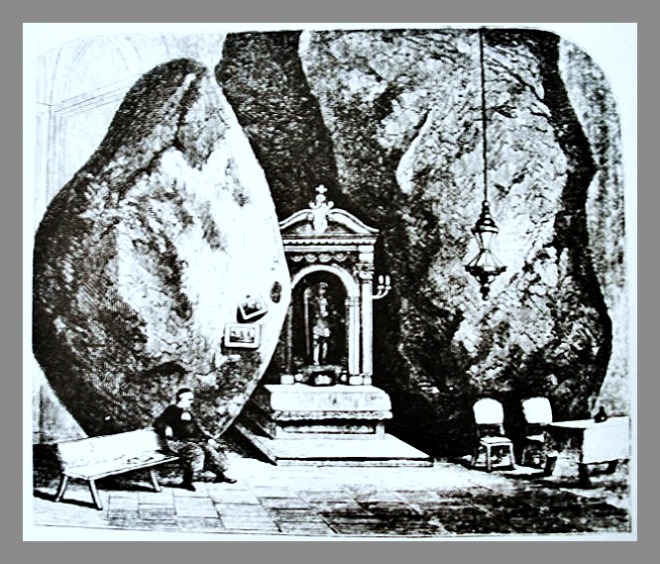 In the 18th century a new church was built around the curious stones. The three stones support each other in an interlocking sort of way; the largest of the three at the back lies over the top of the front two stones, supporting the whole structure. At the front and between the stones stands the main altar and a shrine inside which stands a very nice statue of St Michael (San Miguel) and a reliquary of St Pollonio – the whole thing looking as though it were made to be this way. A 14th century altar-piece can be seen in the church – though this is often locked away for security reasons. The floor of the church is hexagonal, while the roof is pyramid-shaped with a cupola in the centre of the ceiling and a rather large, radiating key-lock boss. St Miguel’s entrance door has an upper axis over which stands a belltower. Legend says that a young man must pass three times underneath the huge stones if wishing to be married the following year; this is said to still take place even today. One rather far-fetched local legend claims that St Michael killed and then buried the devil beneath the boulders long ago before the church was built on the site – something that is said of other churches with a dedication to this saint located upon high places or rocky outcrops. Fergusson, James., Rude Stone Monuments In All Countries, London, 1872. Categories: Ancient Churches / Chapels, Natural Stone Or Other, San Miguel De Arrechinaga Church at Markina-Xemein in Spain | Tags: San Miguel De Arrechinaga at Markina-Xemein in Spain | Permalink.